The longer I look at the 1830s, the more I am fascinated by the collision of science, commerce, and social change. There are few colorful characters from that period that exemplify these more that Robert Knox. 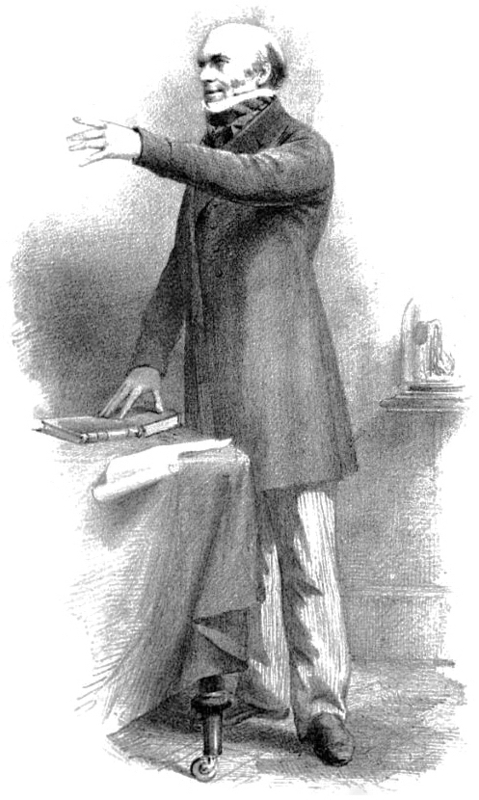 Knox’s lucrative career as a private tutor of anatomy peaked in 1831, when his lectures, public dissections, and research flourished. They fell off precipitously shortly thereafter, victims of changes to medical education, reforms in the laws regarding anatomical study, and Knox’s own mistakes made in dealing with the commerce driven practices of his suppliers. He never shook his reputation for involvement in murder most foul. Born in Edinburgh, he entered the university there at 19 studying medicine, and involving himself in student organizations where he presented well-received papers. Significantly, when he came to the end of his studies, he failed to pass anatomy. Later apologists blamed his teacher for this, but the event had an interesting effect. 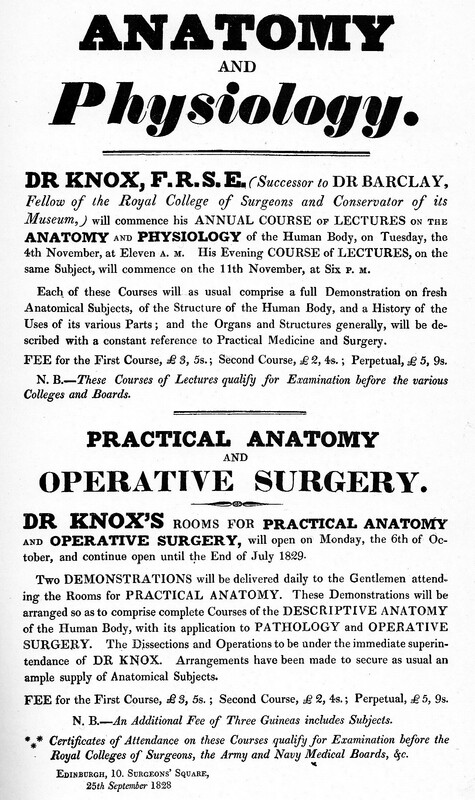 Knox enrolled in private “extramural” classes in anatomy under John Barclay, an eminent scholar. Knox came from modest means. After graduation in 1814 he joined the army. His work treating the wounded after Waterloo left him highly critical of surgical practice and convinced him of the necessity of better training in anatomy. Posted to the Cape Colony in South Africa. After he became embroiled in a controversy, refused a challenge to duel, and engaged in a public brawl, his promotion to Assistant Surgeon was cancelled and he was sent home in disgrace. Back in Edinburgh, Knox became involved in lecturing and convinced Royal College of Surgeons of Edinburgh to create a Museum of Comparative Anatomy with Knox as curator. Shortly after his former teacher, John Barclay took him on as a partner in his business of providing private education. The senior professor of anatomy at the university, the same one who had failed Knox, continued to be held in very low esteem, and the Barclay’s school of anatomy enjoyed popularity. With Knox as lecturer the school became a major force in anatomical education. Barclay died soon after, leaving Knox the business. Between his research and twice a day demonstrations Knox had an acute need for cadavers and difficulty filling his demand. England at this time permitted anatomical study only on the bodies of criminals formally condemned to death and dissection. Popular belief held that criminals deserved such an indignity, but respectable folks should not be treated in such a manner. Scottish law was only slightly less restrictive, allowing for those who died in prison and foundlings. These restrictions meant the supply of cadavers fell short of the need in medical education in general and particularly for Dr. Knox. Enter the resurrectionists, or body snatchers. Since the penalty for interference with a grave was minor and the money to be made great, digging up recently buried corpses became a cottage industry. The practice was widespread to the point families who could afford it hired guards to watch the graves of their loved ones until the point when the corpse would no longer be useful for anatomical dissection. Knox himself not only dealt with Edinburgh body snatchers, he appears to have had a network of agents who brought him bodies from Glasgow, Manchester, and Dublin. In retrospect, it seems inevitable that enterprising criminals would try to hasten the process. During the school year 1827-1828 William Burke and William Hare sold a series of extremely fresh corpses to Dr. Knox, who never questioned the sudden availability of so many corpses with no sign of mud, decay, or the grave—they were fresh and very useful to him. The first corpse belonged to a lodger in Hale’s rooming house. The man owed him money, and his friend Burke advised him to get it back by selling the body to Knox. The reward must have been substantial, because Burke and Hale went into business. Over the course of the next several months they murdered sixteen people and sold their bodies to Knox. Their spree came to light when fellow lodgers, suspicious of the disappearance of a visitor, found her body and reported it. Authorities eventually convinced Hale to turn on Burke and spill the extent of their crimes. 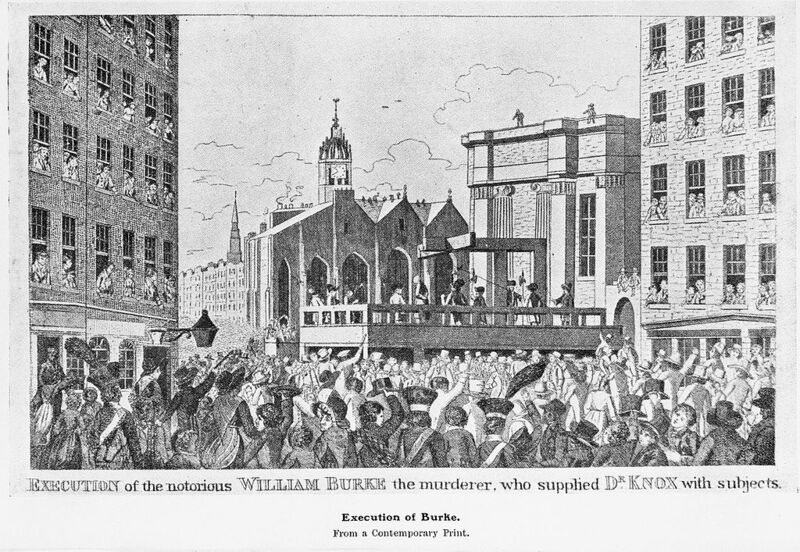 Burke was convicted in a lurid and scandalous trial that called the entire business of selling corpses to anatomists into question. He was condemned to execution and, ironically, dissection. He was executed in front of 25000 spectators and publicly dissected at the university. Hale, given immunity, disappeared. 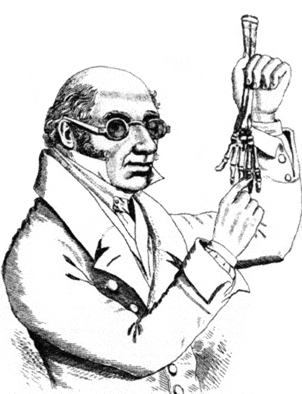 Inevitably the name of the most famous anatomist in the kingdom, Robert Knox, was dragged through the mud. He claimed ignorance of their crimes, and was never indicted or convicted, but questions lingered about what was seen as willful ignorance, and very quickly the scholarly community of Edinburgh turned on him. By 1831 the Royal College of Surgeons forced his resignation from the Museum of Anatomy. For a few years his school continued to function, reaching that peak of students in 1831 and even moving to larger quarters. 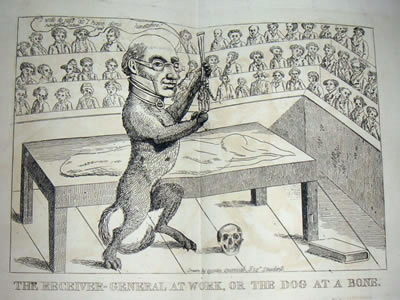 One of the many caricatures circulating after the Burke trial. Immediately after the trial, however, Parliament began to consider a bill to control the illegal trade in cadavers and the regulation of schools of anatomy. The Anatomy Act of 1832 ended the practice of dissecting those executed and regulated access to cadavers. The supply of cadavers to all researchers increased and it cut Knox’s competitive advantage although he continued to buy bodies. In the mid 1830s The University of Edinburgh made their own classes in basic anatomy mandatory, part of a larger shift that saw Britain go from eight private schools of anatomy in 1826 (as opposed to four attached to hospital medical schools) to none by 1871. The need for Knox’s school and those like it ended. When Knox applied for a university chair in pathology, eleven professors blocked him, choose to eliminate the post rather than hire him. Eventually the Royal College of Surgeons of Edinburgh managed to get him banned from teaching in Scotland. He moved to London where he continued to write and even lecture—but not with dissection. He never found a teaching post, but did become a pathologist at the Free Cancer Hospital of London. He died in 1862. Her current series, Children of Empire, is set in the 1830s and she continues to be astounded at the rate of change in that era. Sorry to be so late in commenting! Friday has walked all over me. Fascinating period and activity by Knox, et. al. Great post as always, Caroline!